The Proof Platinum Eagle in the Platinum American Eagle collection is by far the most unique coin in the American Eagle release. While all four versions of the coin are beautiful in their own right, the Proof Platinum Eagles stand out in the group as the only bullion coins from the United States Mint with new obverse designs every year. 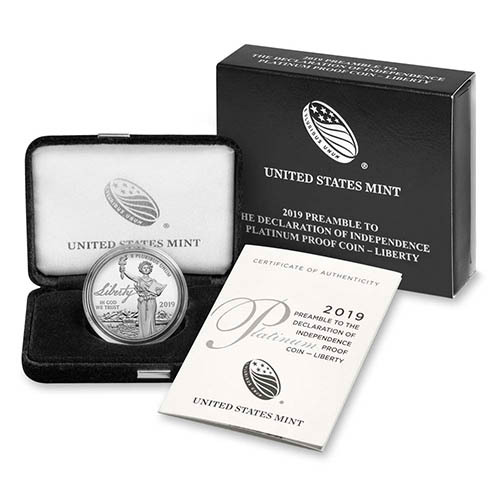 Today, you can purchase the 2019-W 1 oz Proof Platinum American Eagle Coins online at Silver.com. Available to ship inside of a US Mint box with an included Certificate of Authenticity! 23rd Proof Platinum Eagle and second issue in the Preamble to the Declaration of Independence series! On the obverse side is a new design of Liberty watching over the nation. The reverse includes a new design common to this three-coin design series and features an American bald eagle. The Platinum American Eagle Series launched in 1997 with designs from John Mercanti on the obverse and Thomas D. Rogers on the reverse. 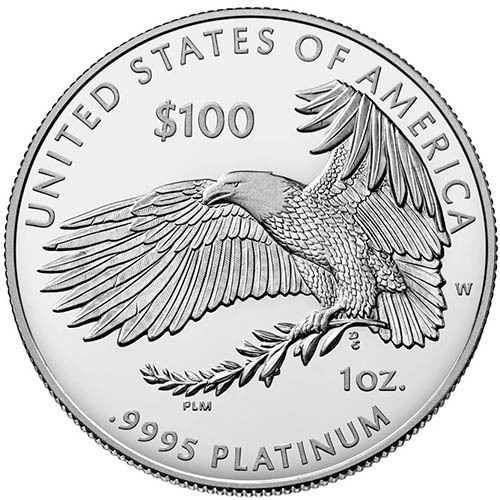 Similar to other American Eagle coins, the Platinum Eagle focuses on Lady Liberty in the obverse design and the American bald eagle in the reverse design. What makes the Platinum Eagle unique is the use of different designs for the bullion and proof coins. Mercanti and Rogers’ designs persist on the obverse and reverse of the bullion version of the coin, but it is the Proof Platinum Eagle’s designs that make the collection truly distinguishable. The Proof Platinum Eagles have a new design on the obverse every year and often feature new reverse designs as well. 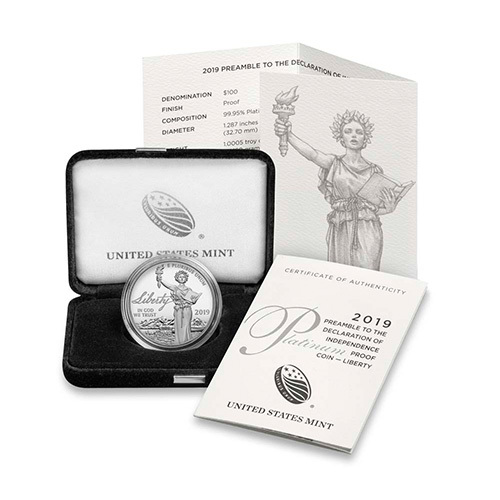 All 2019-W 1 oz Proof Platinum American Eagle Coins are available from the United States Mint with a capsule protecting the coin and a US Mint commemorative box to house the product. Each one comes with its own Certificate of Authenticity. 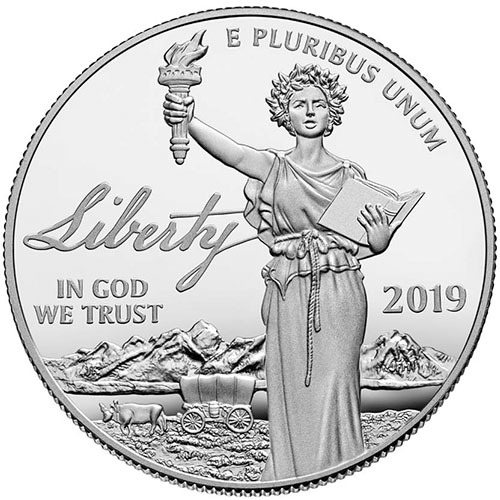 The reverse of 2019-W 1 oz Proof Platinum American Eagle features a new design that is common on the three designs in the 2018-2020 series of Proof Platinum Eagles. It depicts an American bald eagle with its wings spread to soften its landing as it clutches an olive branch in its talons. Please don’t hesitate to reach out to Silver.com if you have any questions about platinum coins. You can call us at 888-989-7223, chat with us live online, or simply send us an email with your inquiries.